Canada's leading speed dating company for singles 25dates.com (www.25dates.com) has recently unveiled statistics supporting the fact that men, at least in the Canadian Speed Dating world, are still the hunters when it comes to looking for a mate. Over nearly 8 years of speed dating events from across Canada, from people aged 19 to 52, men picked on average 8 women per event, while women picked 5 men. Both 22 year old men and women chose the most matches on average, with men picking 12 women per event, while the women picked 8 men. According to 25dates.com President Ragna Stamm`ler, "There were definitely some interesting trends that we had no way of knowing about until we compiled the data, like the fact that as men get older, they pick fewer and fewer women from the age of 25 to 37. But then, men start picking more and more women, each year, until age 47, where their numbers basically plateau until age 55. It's as if men have this increased drive from 37 to 47 to perhaps settle down and have kids. " As women get older, even though there is a drop in the number of men that they pick after age 22, from 26 to 41, the number of men picked plateaus, at 5.6 which is higher than the overall average of 5. This higher interest period appears to align with the prime reproductive years. The statistics also showed that from age 51 to 52, women have a slight spike in number of men picked, from an average of 3 to 5, which interestingly happens just before the average age of menopause, 52. 25dates.com has been providing their speed dating services to close to 25,000 single people dating in Toronto, Mississauga, Calgary, Vancouver and surrounding areas. "Being in business this long and seeing so many people in the controlled speed dating environment that we create for our clients, we've had this incredible window into singles and their dating habits in Canada. ", says Stamm'ler. ``We thought it would be interesting to compile all the data available to us. In the end, the results surprised even us." 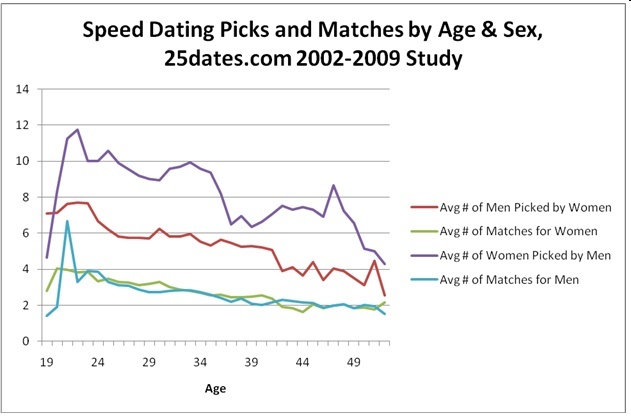 During a typical 25dates.com speed dating event, participants meet at a restaurant, for 25 three-minute dates. At the end of each date, speed daters discreetly check "yes" or "no" next to the ID number of the person they've just met on their match card. At the end of the night, the cards are collected, and 25dates.com tallies up all the matches and emails out the results 2 business days later. According to Stamm'ler, "We find after all this time, that speed dating is still the most effective way of meeting people. It combines the ease of internet dating, where our users can easily sign-up and communicate with us and potential partners, with that all-important face-to-face connection that we provide at our events." The Canadian-owned 25dates.com shows no signs of slowing down, with an average of 3 events per week. "The amount of success stories, including marriages, babies and long-term relationships just keeps on growing. People want to find love and companionship, especially in big cities, and this does seem to be the most cost-effective and efficient way to do it." Stamm'ler knows what she's talking about, she met her husband, Aaron Adamson at a 25dates.com event, and the couple will soon be celebrating the first birthday of their son Shane. Toronto's 25dates.com has had the leading edge on Canada's Speed Dating market for almost 8 years. 75-80% of participants are finding matches, a fact that has helped turn the innovative dating company into a sensation that was recently featured on CNN Headline News. For more information, contact Mandy Jackson at info@25dates.com or 905-842-2822, or visit www.25dates.com.